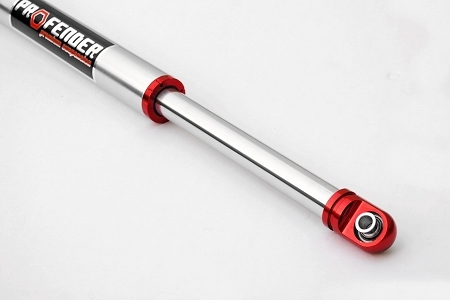 Length Length 12" 14" 16" 18"
A new innovation from Profender is the 2.5” Profender Air Shock. This shock is light weight and heavy duty. It is made of high performance and premier materials. It has a huge shaft measuring 1.625” and designed like our typical air shocks. 2.5” Profender Air Shock has its promise of providing its usersthe best and comfortable rides! This new type of air shock is suggested to anyone considering using the 2.0 air shocks but is also considering and concerned about the strength and durability of the shock being affected by the weight of the vehicle. 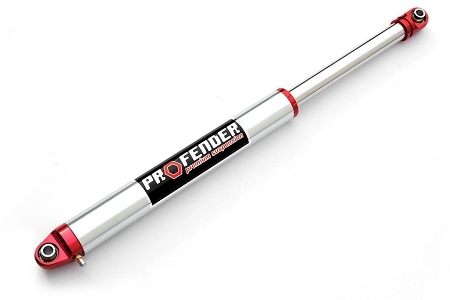 Just like all our products, 2.5” Profender Air Shock, is made of high quality, premier and durable materials. Adjusting the compression ratio is done by decreasing or increasing the amount of oil. The 2.5” Profender Air Shock must be installed vertically to experience excellent performance especially in off road conditions. This product is a good and recommended alternative for the Coil Over Suspension.